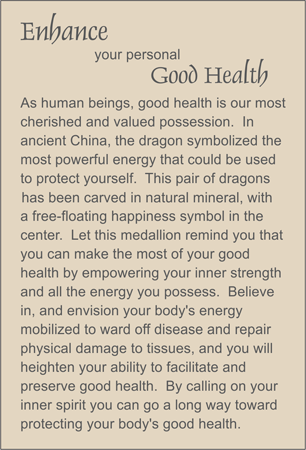 MEDALLION: Green aventurine hand carved medallion depicting two dragons guarding a floating symbol for happiness. ACCENTS: Qui Lain jade woven knot beads, carnelian and rock quartz crystal ellipses. COMMENTS: Get outside and enjoy the fresh air produced by our GREEN planet.